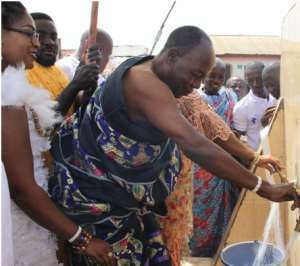 Residents of Amasaman in the Ga West Municipality now have access to potable water as a result of water services extended there by the Accra West Region of Ghana Water Company Limited (GWCL). The extension of water to the Municipality was done during the latter part of 2018 and the Company has opened a new District Office, close to the Works Department of the Municipal Assembly, to attend to the water needs of the people. In an interview with the media, the Regional Communications Manager of the Region, Solace Akomeah intimated that, the Ga West Municipality, which is a fast-growing peri-urban area, with over 170 communities, was one of the water-stressed areas in the Greater Accra Region, with most of its numerous populace lacking access to potable water supply. According to Mrs. Akomeah, one of the biggest hospitals in the area also lacked access to potable water and relied on ground water for its operations, a situation which she said hindered proper healthcare delivery. “Without potable water, the fight to improve healthcare and sanitation is defeated,” Mrs. Akomeah said. On March, 22, 2019, the Company celebrated this year's World Water Day in the capital of the Municipality, with the Chief of Amasaman, Nii Oseiku II and his people. In his address, Nii Oseiku II was full of praise for GWCL for extending water to his people. He entreated his people to eschew all illegalities and go through the right procedures to get their water connections. In another address, the Acting Regional Chief Manager, Ing. Asomani Nyarko said the Ga West area had been under the radar of the Company for a long time as an area requiring water supply. He said he was therefore happy that the Company had finally been able to extend its services there. Ing. Nyarko intimated that the Company had started massive pipeline extensions to cover all the communities without lines to ensure that, in line with the theme for the World Water Day 2019, no one is left behind. THE NORTHERN Regional Police Command has in collaboration with the Drug Law Unit, arrested nine persons suspected to be peddling drugs in Tamale. The swoop brought the combined team to Lamashegu dam, a suburb of Tamale in the Northern region. According to the Northern Regional Police Public Relations Officer, DSP Mohammed Yussif Tanko, who confirmed the arrest to DGN Online, the service received a tipoff about the operations of the drug peddlers in the area. He indicated that nine suspects were arrested from the swoop including a 24 year old female. The police PRO added that large parcels of dried leaves suspected to be Indian hemp were seized from the peddlers. Criminal activities have been on the rise in the Lamashegu catchment area in recent times. Fuel station robbery, and motorbike theft are known to be on the rise in the area. DSP Tanko noted that the service was committed to ensuring the security of all Ghanaians. He added that the swoop will be continued to ensure that all criminal activities were uprooted from the locality and the region at large. Meanwhile, the arrested suspects have been charged with possession of hard drugs without authorization and will be arraigned before court after investigations.